Memorizing the pentatonic scale, and learning how to use it in a fluid and musical manor are two completely different skills. Most courses focus just on teaching you the positions and then leave you to your own devices. Not this one! The focus is all about how to use the scale across the entire fretboard in a musical and practical way. Truly understanding the pentatonic scale will open up unlimited musical possibilities. We have upgraded, revamped, and organized in-studio, live weekly workshops broadcasted in 1080p. These focused, task-based workshops include full tablature, interactivity with the instruction, and even homework each week. We are bringing live, educational instruction into the next generation with this platform. In 2016, we completely re-engineered our recording studio with top of the line gear, including a full suite of 4k cameras complimented by a new audio outfit. The result is beautiful live streams to your computer, in qualities as high as 1080p! 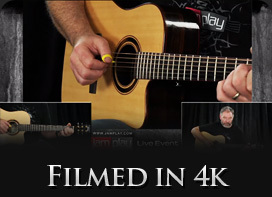 Each live course is supplemented with full tablature, music notation, and even backing tracks. Our live lessons are focused, planned, and even give you homework options on how to improve and look forward to the following week. Our staff fields questions from the audience throughout each section, and opens the "classroom" up for questions throughout each course. You also have the ability to call in live with your own video stream! Our live platform has been a major focus over the past 18 months, and we are very excited to fully unleash it's capability! Attend any of these courses with a full JamPlay subscription and get the benefit of full interaction with our instructors in a focused, planned course. We even have the ability to field your questions with live video call in! And of course, we keep everything, so if you miss a week you can always watch our archive of live courses. 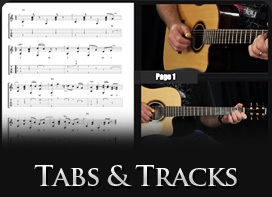 Tabs, backing tracks, and a full course PDF are provided for students, along with homework for each week! Interact with other students along with David and get the instruction you need to advance your playing. In this first session we will explore different licks that are particularly useful with the first position. We will focus on bends using the index, middle and ring fingers. The included backing track will be used throughout the lesson to illustrate the examples. In this section students will learn how to expand their reach to neighbor positions. We will study several useful licks useful to transition from one position to the other. We will emphasis on slides and visualization techniques over the provided backing track. In this session we will develop ideas using the 4th position which has its root on the 5th string. A variety of different practical licks will be learned giving students some useful ideas to put into practice what we learn. In this section we will learn the 3rd position which will tie all the previously learned positions together. We will learn a few useful licks using that 3rd position and put it into application over the provided backing track. 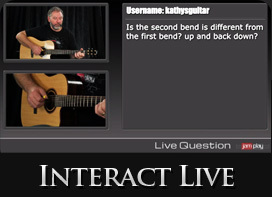 Today we will take a look at sliding pentatonic positions which will help students naturally transition from one position to the other in a musical way. As with the previous lessons we will learn some very useful licks over the provided track. Now that students are comfortable with all five positions, we will explore different sequences that will add excitement and musicality to their playing. We will discuss the importance of playing with a metronome and a backing track. We will explore different ideas using chromatic passages. This will inspire students to create new musical lines by using the simple starting licks I will be teaching. As with the previous sessions, a backing track will be included for students to practice this session. In this final section we will learn how switching pentatonic positions can be an effective way to develop new interesting melodic ideas on the instrument. This session will include a few backing tracks for students to go further and apply everything you have learned during this course.